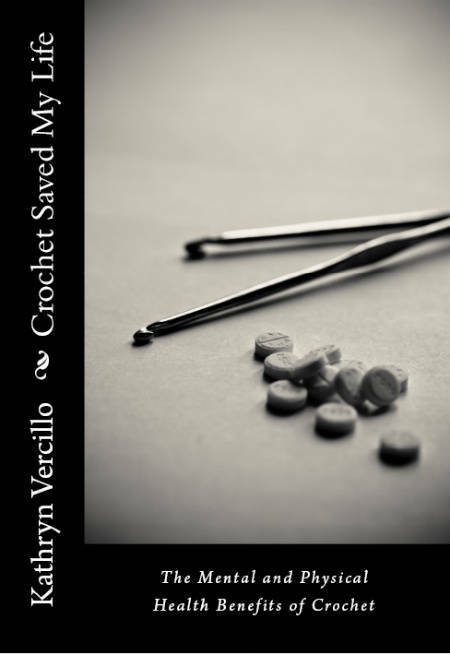 Crochet Saved My Life is both a memoir of depression and anxiety, and also an exploration of crochet as therapy for dealing with both of these conditions. The book features interviews with about two dozen others who have dealt with a number of kinds of clinical depressions, as well as other issues both psychological (most prominently anxiety) and conditions with psychological features as well. The personal stories are both powerful and moving, but when the author delves into neurochemical explanations, the book loses a bit of its steam. Luckily, the personal anecdotes are spread throughout the book, maximizing their use and emotional impact. Some of the benefits of crochet that are explored by this book include: mindfulness, visualization, stress reduction, the setting of achievable goals & pride in accomplishment. Also explored are the benefits of the social component of the so-called crafts such as knit and crochet, in that the social component is optional, online, and low-stress. The author repeatedly emphasizes that crochet is “one tool in the toolbox” and not a cure for anything — and something that some individuals may not even find helpful. She also emphasizes that she is a layman, not an expert in any of the fields explored by the book, and that such explorations are to be understood as an educated layman’s view of the subject matter, and not as an expert’s opinion. The book could have benefited from having a good editor go through and trim down the prose. It is undeniably well-written, but it could have been trimmed down a bit, I think. Still, the tone was friendly and inviting, and the author clearly has spent a good deal of time thinking about her subject, in addition to researching and writing about it. I’d like to think that would be true of most books, but it somehow doesn’t seem that way to me. In my experience overall, and especially in an indie publication, this is a treat. All in all, I would recommend this book to anyone with an interest in the benefits of crafting, or who are looking for some ways to self-help themselves into a better frame of mind, in addition to people who have a history of psychological issues who are open to alternative therapies. Note: I purchased this book through the Kindle store and read it on my e-reader. It is available to the public.